We make available exquisitely designed Garden Stool Set that is widely installed in lawns and gardens for enhancing the beauty of the place. 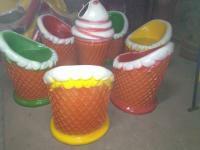 We offer Garden Stool Set in distinguished designs and vibrant colors, which make them highly admirable. Our Garden Stool Set is known for its lightweight, superb finish, high strength and ergonomic design.